The project took place in the County of Longford and was sponsored by Longford County Library and Arts Services and the Aisling children's festival. It was a six week project involving two schools, a town and a country school, as well as two active age groups and a day care centre. The goal was to involve older people with primary school children (9-11 years) in a project culmulating in a play at the Backstage theatre in Longford. The children and the adults explored similar questions, for example, memories of a favourite toy, a birthday, an treat or outing,. I started the ball rolling with some old toys including my eighty year old teddy who became the mascot for the play. 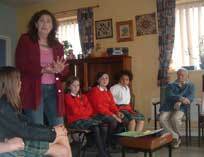 The recordings made by the children and the older people were shared. 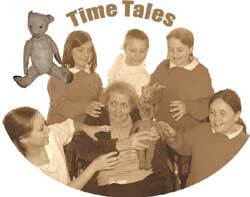 The children used some of the special stories told by the older people to create scenes, e.g. a birthday, a school scene. They also created scenes about what they thought the future might be like. When the older and younger groups met these scenes were used as a focus point for shared discussion. from this point a script for a play began to emerge. A child and her grandmother share a birthday, A magician entertaining at the party opens a viewing door to the school, birthday and other scenes in the past and the future. The play was great fun. 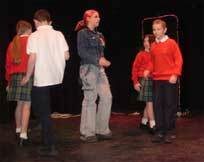 About six of the active age group and one lady from the Daycare centre acted on stage with the fifty or so children. It was difficult for others from the daycare centre to act on stage but it was inspirational to have Kathleen, who was wheelchair bound, on stage. The children just loved her and chose to tell one of her memories. The interaction between the children and older people was excellent. The children were very proud of the work they had done. I realised how much they had gained from the experience when I heard their interview on the radio. This project lead directly to further reminiscence work with tSt Joseph's Daycare Centre and the making of a special book about Christmas memories called "Candles in the Window". HAVE A LOOK AT A PAGE OR TWO FROM "CANDLES IN THE WINDOW".